This is what we call cucumber season. It’s that sultry time of year when everyone is on vacation and the only thing that’s happening is cucumbers are ripening on the vine. This year we’re having an unusually exciting cucumber season, with the largest social protests in decades, but at least in some regards, it’s cucumber season nonetheless — our little green friends are overflowing from their market stalls and are cheap and abundant for pickling. Pickles are somewhat of a religion over here. 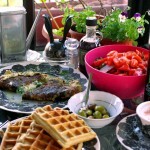 They’re ubiquitous — as the author Nathan Zach put it, they’re served more as a matter of course than as actual food. They’re also incredibly easy to make. I remember the first time I made pickles. Or, I should say, tried to make pickles. I dumped the cucumbers into a wide plastic container, which enabled them to float as opposed to staying mostly submerged, and a white mold developed on top. I wound up throwing the whole batch out. In retrospect, they probably were fine — a bit of white mold is a natural part of the pickling process, and my only real mistake was not keeping the pickles properly submerged. A basic brine is quite simple — you add enough salt to your water so that an egg floats in it, as my former roommate Naifeh taught me. That comes out to 1 tablespoon salt per cup of water, and it will give you distinctly salty pickles. You also could use a little less — 3/4 tablespoons salt per cup of water, in order to get distinctly unsalty pickles. I prefer mine on the salty side. 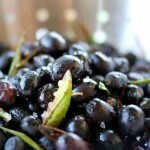 As for seasonings, they’re relatively constant — garlic, bay leaves, hot pepper and sometimes vinegar. In the stores, you’ll find pickles marked as vinegar pickles or salt pickles, the main difference being that the former have some vinegar added to the salt brine. I like vinegar in my pickles — much like I like vinegar in my salad. Cucumbers here are small and (hopefully) flavorful — that’s how consumers like them. They range between 4 and 6 inches long (10 to 15 centimeters), so I can cram 10-12 of them — about half a kilo/1 pound — into a coffee jar. That’s just the right quantity for us — the perfect amount to finish in a week. I leave it on the counter like a cookie jar, and 2 days later, we have fresh pickles, perfect for munching. I’ve been known to snack on a pickle before my morning coffee. Because, well, they’re good. 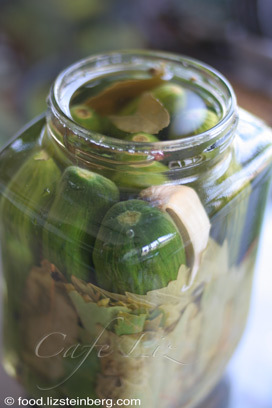 What’s your favorite kinds of pickles or pickling seasonings? The cucumbers a day after they went into the jar, and after four days in the jar. Mix the water and the salt. The salt should fully dissolve at room temperature. Arrange the cucumbers upright in a clean jar with a lid. 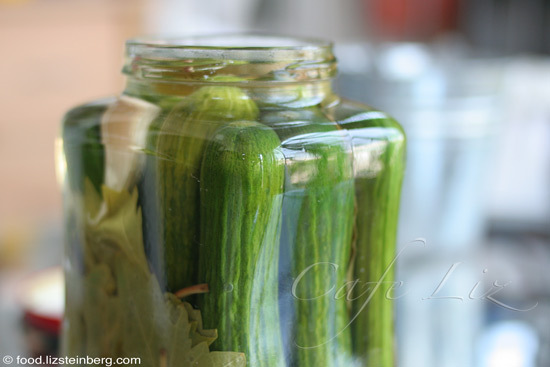 The only criterion for the jar is that it should enable you to keep your cucumbers upright and submerged once the liquid is added. If you’re using grape leaves, put them in the jar, too. Note: If the jar has a metal lid, the salt will corrode it over time (after a year plus). 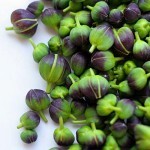 Fit the seasonings in around the cucumbers — the garlic cloves, the bay leaves, the peppercorns and the hot pepper piece. Pour the vinegar into the jar. Top off with the salt water — use as much as you need in order to cover all the cucumbers. Close the jar, but not so tightly that gas can’t escape. Let sit for 2-4 days until the cucumbers taste like pickles. They will shrink slightly as they cure. Don’t refrigerate; the heat helps them along. You don’t even need to keep the pickles out of the sun. In this summer heat, my pickles are ready after 2 days, but people generally leave them a bit longer. 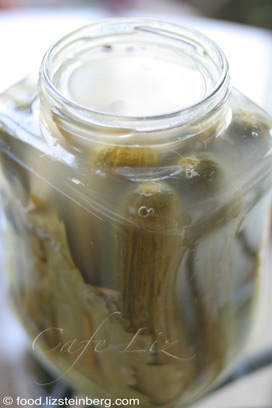 9 Responses to "Homemade pickles for cucumber season"
Great post, and very tempting pictures! I love pickling and have been doing it for, um, mumble mumble years (okay, 28). My recipe is pretty much the same as yours, and I like to go heavy on the garlic, and also to make a special batch just for me with tons of chili peppers to heat up the cool crunch of the cucumber, or the string bean. BTW, my garlic cloves always turn blue. I like the contrast with the murky green of the cuke and the sharp red of the shata pepper. Oh, you totally reminded me! I read somewhere that it’s the iodine in regular salt that makes garlic turn blue, and that you can avoid this by using kosher salt. Haven’t closely examined my garlic to find out if it’s true. Wow, I never thought of that. I’ll make my next batch tomorrow with kosher salt and see what happens. I don’t mind the blue, I know it’s harmless, but it does cause an indeterminate amount of ick-factor with the family and guests. I haven’t tried it yet, got stuck with yeasty beasties over Friday and didn’t have a chance to even shop for the proper cukes. Maybe this Friday, I will absolutely let you know when it happens! I am pickling AS WE SPEAK!!!!!!!!!!! There is something called pickling salt, must be missing something, and it keeps the water from getting cloudy. So that would be the Cadillac of salt for this purpose. I toss in carrots and when I have green tomatoes at the end of the season that I know will not ripen, I pickle those. THAT’S old school. Thanks! Enjoy your pickles. Haven’t heard of the salt. Liz, do I understand you correctly that these are to be left outside in the sun?